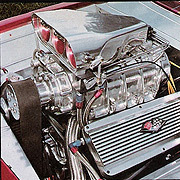 The Official H-Body Internet Community • View topic - Adding pics to Garage? 1975 Vega GT ProStreet "Footloose"
1993 Mark VIII Supercharged "Tasca SuperMark"
1995 Lincoln Mark VIII "The TerminVIIIor"
Re: Adding pics to Garage? 'BAD', I think you can add pics by using the "New Modifications" button at the bottom of your garage. It has a "browse...add" function.